Starburst Slots - Review & Play for FREE at Lord Bingo NOW! Step 1 – In order to play Starburst, you must first place your bet in terms of coin level on the bottom left, and coin value on the bottom right. Step 2 – Choose how many of the 10 pay lines you wish to activate. 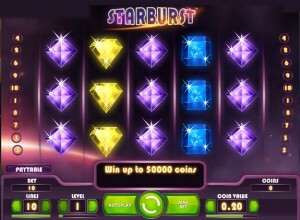 Step 3 – Click on the round button in the middle to start spinning the Starburst slots game. The 5-reeled Starburst game will blast you right into outer space with its immaculate graphics, sleek interface and twinkling symbols – although they could have put a bit more effort in and given us more theme-based symbols. The features, however, may make up for that. Starburst offers two-way-wins as well as stacked symbols. The wilds appear on reels 2, 3 and 4 and expand to occupy the entire reel on which they land; not only does they replace other symbols, but they also awards re-spins. The wilds remain in place during the re-spins so your chances of winning are increased. While Starburst may lack additional bonus games, it does offer seamless game play and is certainly worth a try for any skill level.